On Saturday, April 27th, from 2-4 pm, the Art Lovers Book Club will be discussing artist colonies – gathering places where artists can go to live, work, and interact with like-minded individuals. These special places nurture the creative spirit. The event will launch with a presentation from artist Jane Lincoln, representing 21 in Truro, a group of women artists who annually convene in Truro, MA for a week of retreat, companionship and extensive art-making. Jane Lincoln has had over thirty solo exhibitions and exhibited at over fifty museums and galleries. She has received over one hundred awards. Jane is listed in Art in America Guide and Who’s Who in American Art. She is featured in volume thirty-two of Studio Visit, 2015. Her work is featured in the book Contemporary Cape Cod Artists: On Abstraction by Deborah Forman, 2015. She is also featured in Cape Cod Arts 2018. 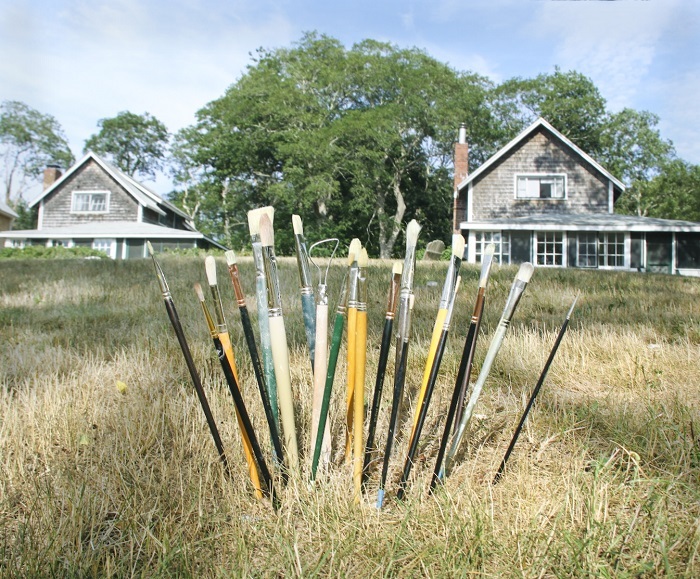 21 in Truro’s focused retreats allow the artists to express their individual responses to the natural beauty of the Outer Cape. During this time, dedicated to joy and ease, they support one another in meeting the challenges of leading a creative life. Reservations for the Art Lovers Book Club are not required, but are appreciated. Please call 508-222-2644 x 10 or email office@attleboroartsmuseum.org by April 26th. Guests are not required to have read any of the suggested books to attend. Many participants first attend the Museum’s book club meetings and then read either the selected text or suggested books. The April 27th event is presented with support from the Jo and Tony Nyzio Visiting Lecturer Fund. Attleboro Arts Museum The Attleboro Arts Museum involves audiences of all ages and backgrounds in the visual arts through diverse educational programs and engaging arts experiences. We work to support the creative and artistic development of both promising and professional artists. The Museum is a privately supported, non-profit arts institution whose core commitment to “Arts for Everyone” guides the Museum’s programs and operations. Presented with support from the Jo and Tony Nyzio Visiting Lecturer Fund. The Art Lovers Book Club at the Attleboro Arts Museum blends art, culture, and literature through vivid presentations and discussions held in the Museum’s main gallery setting. An author, subject matter expert, or screening of a film opens each session. Meetings are free of charge and open to the public.